Australia look set to save face in this Ashes series as they are in full control of the fifth test at the Oval. Putting this down to a Trent Bridge hangover for England or the lack of pressure now on the Aussie team would be disrepectful to how Australia have played, whilst England have just not turned up. 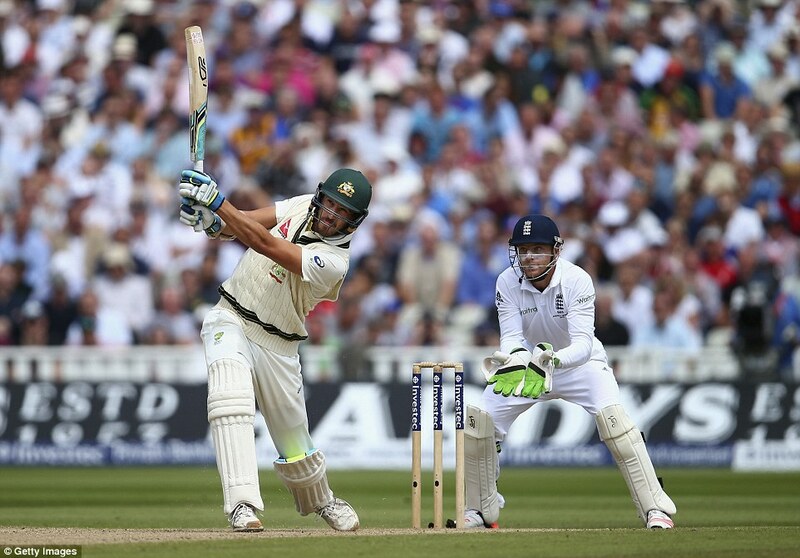 Australia racked up 481 in their first innings, but England collapsed to 107-8 in reply. On day one Rogers and Warner had put on 110 before Rogers fell for 43. Warner (85) and Clarke (15) also fell, but Steve Smith and Adam Voges remained unbeaten as they put on 101 to end the day on 287-3. There were wickets for Mark Wood, Moeen Ali and Ben Stokes. Adam Voges (76), Mitchell Marsh (3), Peter Nevill (18) and Mitchell Johnson (0) all fell before lunch, but England’s bowling was nowhere near the standard set so far in the series. 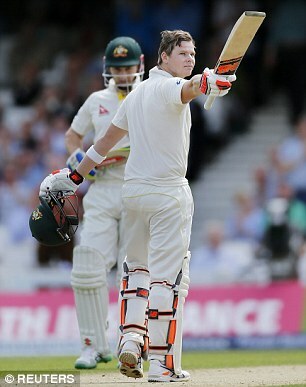 Australia went to lunch on 376-7 with Steve Smith passing his century. He was given a reprieve on 92, after Steve Finn overstepped by a good six inches. Smith and Mitchell Starc put on 91 before Smith was bowled by Finn for 143, and Starc soon followed, lbw to Stokes for a fine 58. Interestingly, Starc’s dismissal only the second review overturned the whole series, showing how well the umpires have performed so far. Peter Siddle, a surprise inclusion in Australia’s side, added 1 as the visitors finished on 481. Stokes, Finn and Ali took three wickets a piece, with Mark Wood taking the other. If England were poor with the ball, they were even worse with the bat. Nathan Lyon dismissed Cook before tea with a beautiful delivery for 22. The hosts then lost 7 wickets for 46 runs. Adam Lyth continued his poor series with only 19, putting England on 46-2. Bell, Bairstow and Stokes were the only men to make it to double figures, with Root, Buttler and Broad suffering the embarrassment of not even reaching that milestone. Mitchell Marsh took three wickets, whilst their was two a-piece for Lyon and Siddle, and one for Mitchell Johnson. Although it seems that England have just been utterly useless, which they have, credit does have to go to the Australian bowlers for forcing them in to this dismal showing. Moeen Ali and Mark Wood (both on 8) resume tomorrow at 107-8 with absolutely no pressure on them with the match seemingly out of sight. England have regained the Ashes after another comprehensive victory over Australia. All memories of the 5-0 humiliation down under were wiped clear as they managed to win in only three days for the second consecutive match. Mark Wood took the winning wicket as England took the remaining three wickets for 12 runs. England now lead 3-1 in the series heading in to the final test at the Oval. 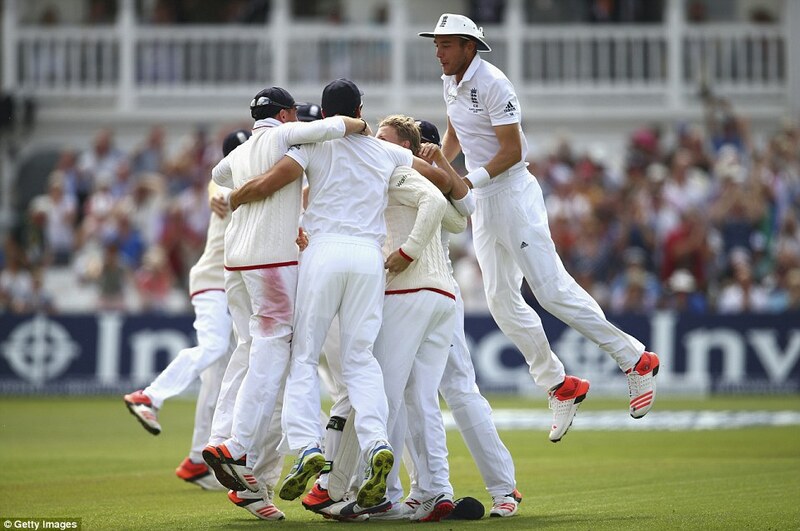 The England players celebrate after regaining the Ashes in emphatic style. Australia resumed on 241-7, 90 runs behind, with Adam Voges on 48 and Mitchell Starc on 0. Ben Stokes took his sixth wicket of the innings, tempting Starc in to playing, but he could only edge to Ian Bell at slip. Ben Stokes’ figures of 6-36 are his best test figures. Josh Hazlewood could not add any to the total, as Mark Wood knocked out his middle stump with a terrific delivery. A rare instance for Aussie fans to shout about occurred as Voges ran a quick single to reach his 50. Nathan Lyon brought up 250 for Australia, flicking the ball down leg side for a four. 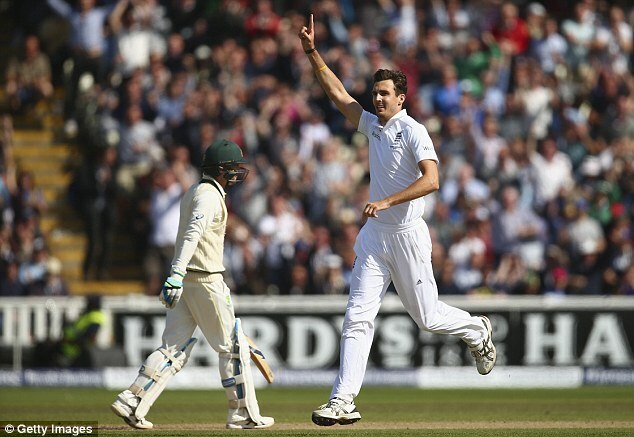 But the next ball saw Lyon’s stumps flying, as Mark Wood bowled the ball that won England the Ashes. Australia had been bowled out for 253, meaning that England won the test by an innings and 78 runs. Nathan Lyon could do nothing as Mark Wood scattered his wickets. After all he has been through as captain, Alastair Cook was almost in tears at the end of the match, showing how much this Ashes victory, and the manner of it, meant to him. In contrast, Aussie skipper Michael Clarke announced that “it was the right time” for him to announce his retirement from test cricket after the final test at the Oval. England are on the verge of regaining the Ashes after Australia lost their top four batsmen for just 23 runs. The visitors had looked to be back in with a chance as their bowlers performed admirably before lunch, and openers Chris Rogers and David Warner took them to 113 without loss. Mitchell Starc claimed six wicket for Australia, whilst Ben Stokes ripped through the Aussie top and middle order with five wickets. England could claim victory tomorrow without having to bat again; they need to take three wickets for 89 runs. Joe Root risked getting out twice, as he began the day trying to carry on where he left off. It was third time lucky for Mitchell Starc, as Root nicked behind for 130 as he attempted a drive. Mark Wood’s impressive innings of 28, including 5 fours, was ended by an equally impressive delivery from Mitchell Starc, who claimed his fifth wicket. Starc produced another top delivery to bowl Jos Buttler for 12. Buttler had attempted to be more positive, but continued to fail to put a big score together. Ben Stokes nicked Hazlewood behind for 5, meaning England were 332-8, losing four wickets for 58 runs in this session. 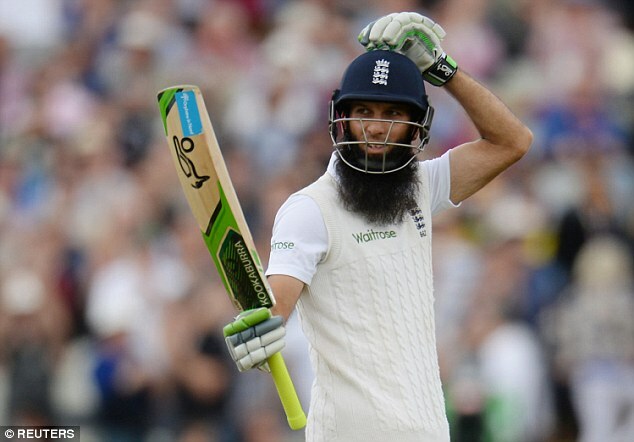 Moeen Ali accelerated England’s progress, bringing up 350 with a big six. Along with Stuart Broad, who hit 2 fours and a six, the pair put on 58 to increase England’s lead past 300. Mitchell Johnson broke the pair though, with Steve Smith catching Ali with a superb diving catch for 38. Alastair Cook declared before lunch on 391-9, giving the Australian openers a tricky few overs to navigate before the break. After yesterday’s misfortunes, Australia might have thought that their luck had finally come in. David Warner was dropped twice, a routine catch from Cook on 10, and a tougher one on 42 where the ball sprung out of the hand of a diving Ian Bell. Chris Rogers was offered a reprisal, as he was caught by Root with the score at 105 without loss, however a no ball was called after Wood had overstepped. But England’s bowlers now smelt blood, and Ben Stokes stepped up to the plate. He dismissed Rogers, who could only edge to Root at slip for 52, and fellow opener David Warner, who top edged a shot up in the air to Stuart Broad. Shaun Marsh then edged Stokes to Root for 2. Fittingly, Stokes took the catch for the vital wicket of Steve Smith, who fell to Broad for 5. The top order was now gone, putting on only 23 runs after Rogers’ dismissal. Broad’s ninth wicket of the match moves him to fourth on England’s all time wicket takers with 308. Michael Clarke’s move down the order appears not have had any impact on his form, as he was caught for 13. Cook fumbled the catch, but managed to palm it back in the air for Ian Bell to take the catch. Peter Nevill was caught for 2 by Cook, but Finn had overstepped, giving Australia a second reprisal. Nevill was the next to fall, going lbw for 17 to Stokes, giving the England man figures of 4-32. Stokes took his fifth wicket as Mitchell Johnson edged to Cook, who finally got his catch, for 5. Australia finished on 241-7, as the umpires led the players off the field for bad light. They trail England by 90 runs. 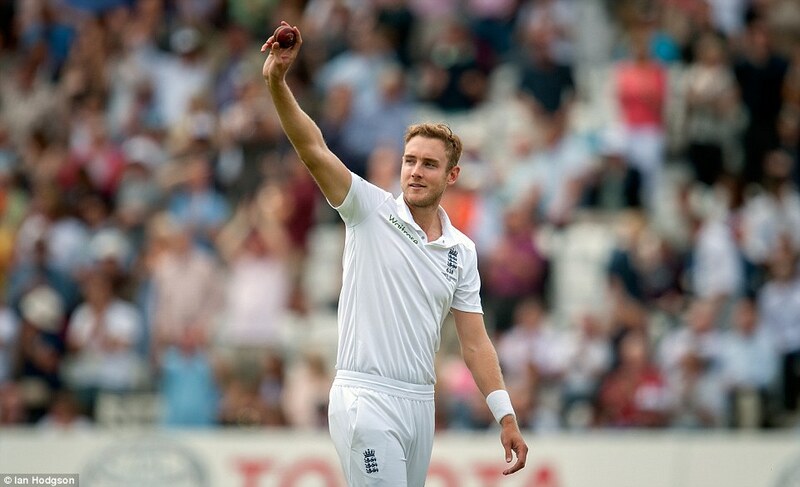 Stuart Broad produced career best figures of 8-15 as Australia slumped to 60 on the first day at Trent Bridge. The visitors lasted only 18.3 overs as they were skittled out before lunch in one of the most remarkable days in Ashes history. England ended the day on 274-4, a lead of 214 runs. This was helped by an unbeaten century from Joe Root and a half century from fellow Yorkshireman Jonny Bairstow. England won the toss and elected to bowl. 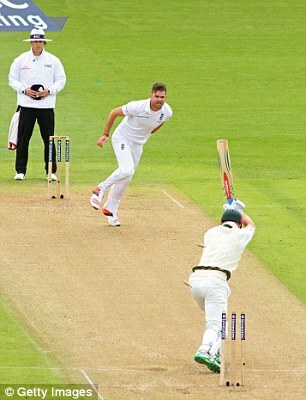 It took only three balls for Stuart Broad to begin his one man mission, as Rogers edged to Cook at slip for 0. Steve Smith also fell in the first over, making 6 before being caught straight on and edging to Root. Mark Wood made the score 10-3, as opener David Warner nicked behind to Buttler. Broad added a further two wickets, with Shaun Marsh (0) and and Adam Voges (1) being caught by Bell and Stokes respectively. Ben Stokes’ catch was outstanding, as he dived to his right and plucked the ball from behind him at fifth slip. Michael Clarke was the first Aussie to make it in to double figures, but he was caught by Cook after thrashing out at a Broad delivery. With this dismissal Broad equalled the fasted ever five wicket haul, in just 19 balls. Steven Finn bowled Peter Nevill for 2 to get his first wicket, leaving Australia 33-7. Mitchell Johnson offered some resistance, hitting two fours to pull the visitors towards 50. But Broad cleaned up the Australian lower order, with Starc and Johnson being caught by Root in virtually identical dismissals. Nathan Lyon added a further 9 to bring Australia to 60 before he was caught by Stokes. The state of the Aussie innings was that ‘Extras’ top scored with 14, and only two batsmen made it in to double figures. With such a low target, England could come out and bat without any pressure. Things started brightly, as both openers made some early boundaries. But having retained his place despite his poor form, Adam Lyth fell early on again, thin edging a Mitchell Starc delivery behind to Nevill for 14. Ian Bell was unable to add to his consecutive half centuries at Edgbaston as he was dismissed lbw by Starc for just 1. With England 34-2, Alastair Cook and Joe Root put on a partnership of 62. 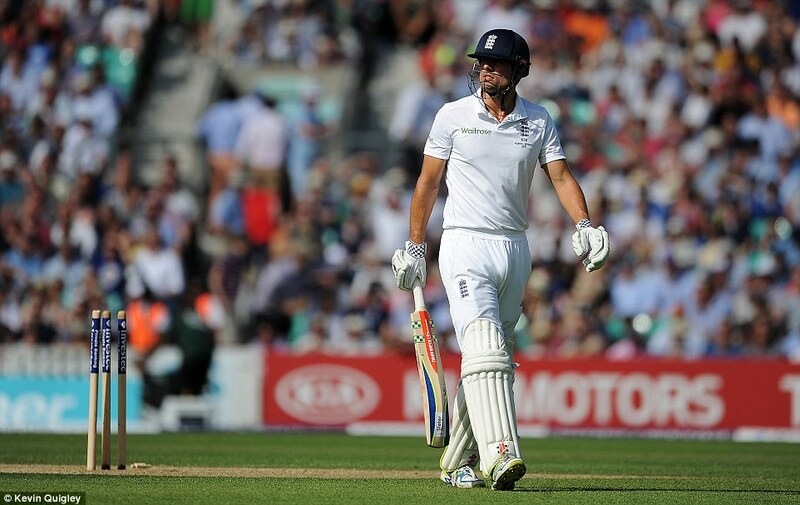 With the score at 65-2, Cook was fortunate to stay in as he edged between two slips. Michael Clarke and Steve Smith both dived, but Smith only succeeded in helping the ball for four and possibly taking the catch away from the skipper. Cook did fall, also lbw to Starc, making it 96-3. His score of 43 was his second highest of the series, but the disappointment was visible as he walked off agonisingly close to his half century. From then on the Yorkshire duo Joe Root and Jonny Bairstow took centre stage. Root brought up his 50 with a four, and when the pair went on to pass the 100 partnership. Bairstow made his first test half century in two years, from just 73 balls, with a four down leg side. Joe Root soon brought up his ton with a four, his sixteenth of his innings, and his second ton of the series. Jonny Bairstow risked getting out many times throughout his innings, but the closest he came was when he was almost run out, but Mitchell Johnson was unable to direct a scoop on to the stumps. To add insult to injury, England nicked another run from the overthrow. The Yorkshire partnership was finally stopped as Jonny Bairstow was caught by Chris Rogers at square leg. Bairstow made 73 before Hazlewood dismissed him, and created a partnership with Root worth 173. England put on a further five runs before close of play to finish on 274-4, a lead of 214. 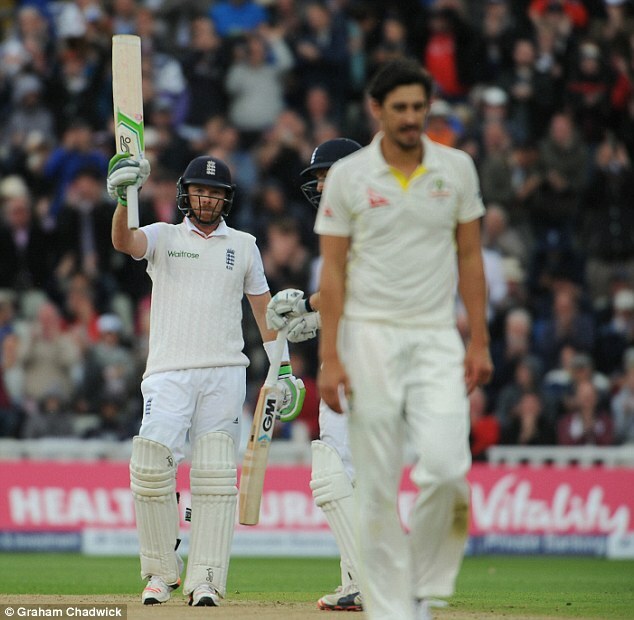 Ian Bell led the way as England beat Australia in under three days at Edgbaston. In one of the most rollercoaster Ashes series in recent years, the hosts now lead 2-1 after an 8 wicket victory in the third test. Peter Nevill and Mitchell Starc gave Australia a glimmer of hope, both making fifties, but the target of 121 was too low for the bowlers to stand any chance. Australia’s batmen came out with no pressure on them, and it showed. Peter Nevill brought up his fifty as he and Mitchell Starc found the boundary five times in the first four overs. But Nevill was given a let off, as he gloved the ball behind, with Buttler taking an impressive catch, but the umpire gave him not out. Replays showed that Nevill would have been given out if England had any reviews remaining. Starc and Nevill’s partnership passed 50 before Nevill was caught for 59 in an almost carbon copy of his earlier let-off. Mitchell Starc continued the resistance bringing up his 50 with a six, which also put Australia 100 ahead. Josh Hazlewood added 11 before Joe Root dived high to take a superb catch at slip. Mitchell Starc’s was eventually dismissed as he chipped straight to England’s substitute fielder, on for Jimmy Anderson. It ended an impressive innings of 58 which had given the Aussie bowlers something to play for. Australia were saved by their mid-to-lower order, who recovered to finish on 265, giving England a target of 121 to win. England would have wanted to try to reach their total with minimal damage, and openers Alastair Cook and Adam Lyth needed runs to end their poor form. However Cook fell early on for 7, clean bowled by Starc. With the score at just 11-1, there was a chance of a few nerves creeping in amongst the England team, but Ian Bell showed that was not the case. The Warwickshire man seemed to be on a mission to win the match by himself, punishing the Aussie bowlers with 20 from his first nine balls. Australia captain Michael Clarke dropped Bell on 20, putting down a straightforward catch at slip. Fittingly, Bell brought up England’s 50 with a four. Adam Lyth’s place in the team may be under consideration, as he went lbw to Hazlewood for 12. Bell brought up his second 50 of the match by hitting a four on the off side. 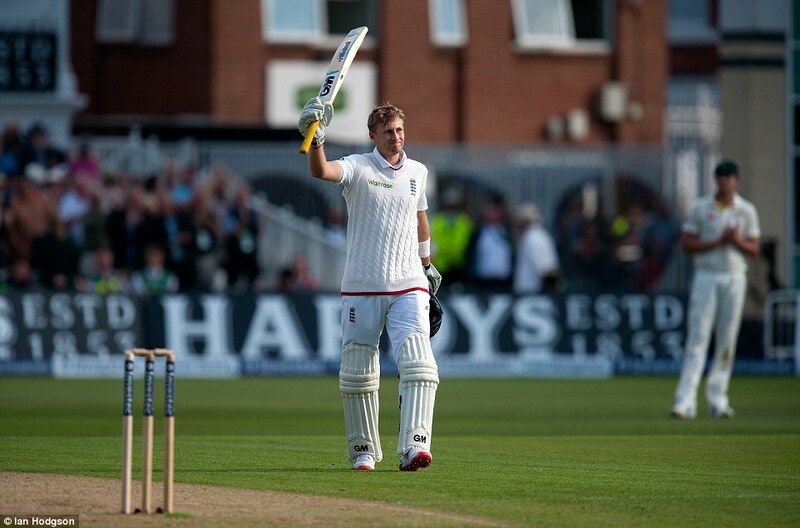 Joe Root also looked in a hurry to win the game, hitting 6 fours and a six to contribute to their partnership of 73. England were able to reach their target without further damage before a delayed tea, as Joe Root flicked the ball over a close field for four. England’s emphatic win was the perfect response to their disgraceful showing at Lord’s, with Steven Finn’s 8 wickets a particular highlight. Jimmy Anderson’s injury will rule him out of the fourth test, and presumable Mark Wood will come back in to the team after just missing out on this test. England are set to wrap up the third test at Edgbaston in an unprecedented three days after restricting the visitors to 168-7, a lead of just 23 runs. The hosts had resumed the day on 133-3, but another day of exhibition bowling saw 14 wickets fall. Moeen Ali and Stuart Broad made sure that England capitalised on the first day’s bowling display, whilst Steven Finn’s six wickets decimated the Australian middle-order. Only David Warner, who put on 77, offered any resistance to the English bowlers. The day was marred by a potential series-ending injury sustained by Jimmy Anderson, who went off with a muscle injury. Mitchell Johnson opened the day brightly for the Aussies, as he took two wickets in three balls. Both Jonny Bairstow and Ben Stokes fell to short balls cannoning off of them to Peter Nevill. Joe Root brought up his 50, but got out for 63 after nicking a poor Mitchell Starc ball to Voges at slip. After surviving one review, Jos Buttler continued his poor series, going lbw to Lyon for 9. However, Hawkeye revealed the ball to be missing the stumps, meaning had Buttler reviewed the decision he would have stayed in. With England seven down and leading by only 85 runs at lunch, Moeen Ali and Stuart Broad built up a partnership of 87. Ali hit 11 fours on his way past fifty,whilst Broad found the boundary three times. But Broad fell to a short ball from Hazlewood, skying it to Mitchell Marsh. Moeen Ali’s fantastic innings came to an end in the same over, as he lobbed to Warner at the boundary. Anderson was the last to fall, with England finishing on 281, a lead of 145. Stuart Broad drew first blood for England, trapping Chris Rogers lbw for 6. David Warner carried Australia past 50, providing 30 of them himself. Steve Smith was unable to produce a similar display though, adding just 8 before he skied a Steve Finn delivery high to Jos Buttler behind the stumps. Adam Lyth took a great diving catch to dismiss Clarke for 3, and Finn was on a hat-trick as Voges edged to Bell on the next ball. Mitchell Marsh survived the hat-trick ball, as well as an lbw review, but was bowled by Finn for six. Australia had crumbled, losing four wickets for only 30 runs. And it looked as if England could have wrapped up the match today as David Warner looped Adam Lyth for 77, leaving Australia 111-6, still trailing by 34 runs. It wasn’t long after dismissing Warner that Anderson pulled up with a suspected side muscle injury. Steve Finn took his fifth wicket of the day, as Mitchell Johnson top-edged to Ben Stokes at backward point. Australia survived the day, as Starc and Nevill took them to 168-7 at close of play. England bounced back from their dismal defeat at Lord’s in perfect fashion by taking charge of the third test at Edgbaston. The hosts bowled out Australia before tea, with James Anderson taking 6-47, before putting themselves just three runs behind at the close of play. Steven Finn and Jonny Bairstow came in for Gary Ballance and the injured Mark Wood for England, whilst Australia named an unchanged side. Australia won the toss and chose to bat. England set the tone of the day early on, as David Warner had to dive to save himself from being run out without playing a ball. It wasn’t long before he did fall though, lbw to Anderson for 2. Steve Finn marked his return to the side after a two year absence, first taking Smith’s wicket, caught by Cook for 7, and bowling Michael Clarke for 10. This early flurry of wickets left Australia on 34-3 when rain stopped play. Adam Voges and Chris Rogers offered a little resistance, with a partnership of 43. Straight after lunch, Voges was drawn in to an Anderson delivery, but nicked behind to Buttler as he tried to pull out at the last second. Anderson took his third wicket as Mitchell Marsh edged behind without scoring. Australia mid-order collapse continued, as Peter Neville left an Anderson delivery, which cannoned into off stump, leaving the score at 86-6. Anderson’s took his eighteenth five wicket haul, as Ben Stokes caught Mitchell Johnson at slip for just 3. Chris Rogers continued his single handed resistance as a boundary brought up his 50, meaning that he’d contributed over half of Australia’s runs. 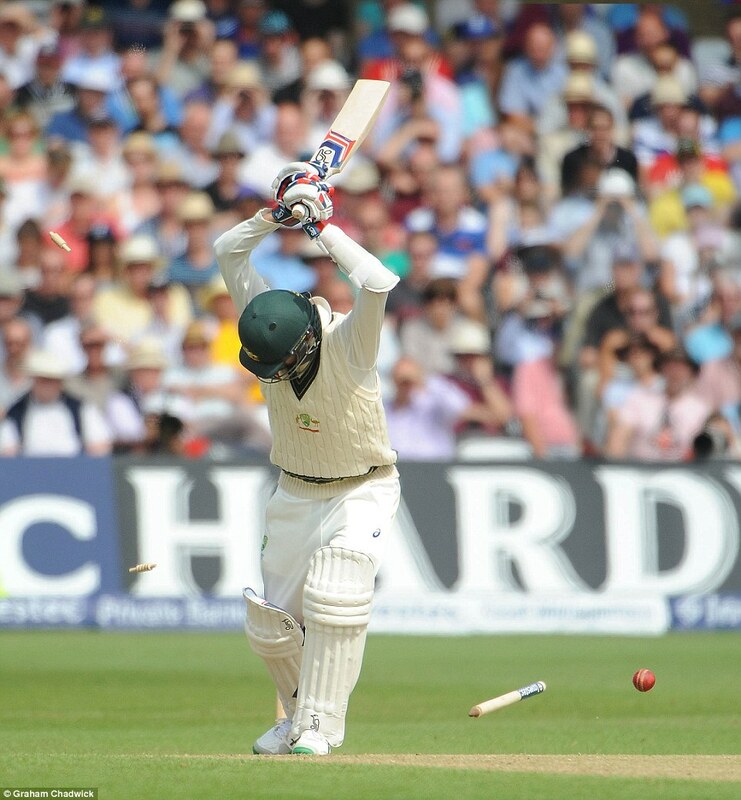 All hope Australia had of batting out the day was lost as Rogers was trapped lbw by Stuart Broad for 52. Broad dismissed Mitchell Starc for 11 and Anderson took his sixth wicket, bowling Nathan Lyon for the same score. Australia finished on 136, dismissed in only 35.4 overs. Adam Lyth contined his poor series, playing at a wide shot and edging behind to Hazelwood for 10. 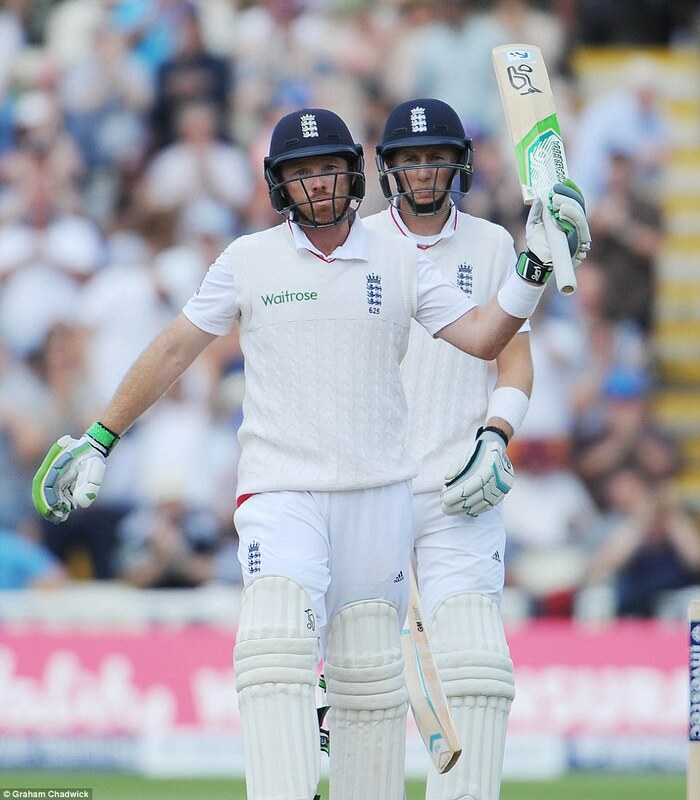 Ian Bell came in at three, and alongside Cook stabilised the hosts. A Cook boundary took England past 50, and consecutive fours from Bell brought up to 50 partnership from just 53 balls. Alastair Cook was very unfortunate to fall, as he played straight in to Voges’ midriff. The short leg somehow managed to hold on to the ball, as it caught in his arms that he had raised to protect himself. Ian Bell brought up England’s hundred with a boundary, but skied to David Warner just after he passed fifty. England closed on 133-3.